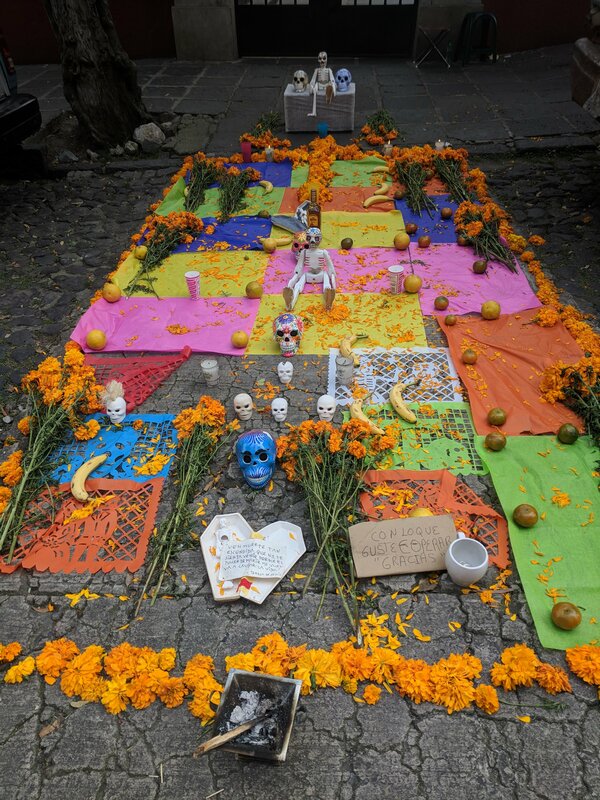 When I first learned about the customs around Día de los Muertos I felt surprisingly joyous, even though the holiday is focused on remembering family and friends who are no longer living. Celebrated in Mexico and many other Hispanic cultures, the holiday is similar to the Memorial Day in the United States including rituals around remembrances, stories, and family gatherings. What better way to remember the quirks and family legends around the grandpa’s love of tequila, or Aunt Maria’s passion for cigarettes? 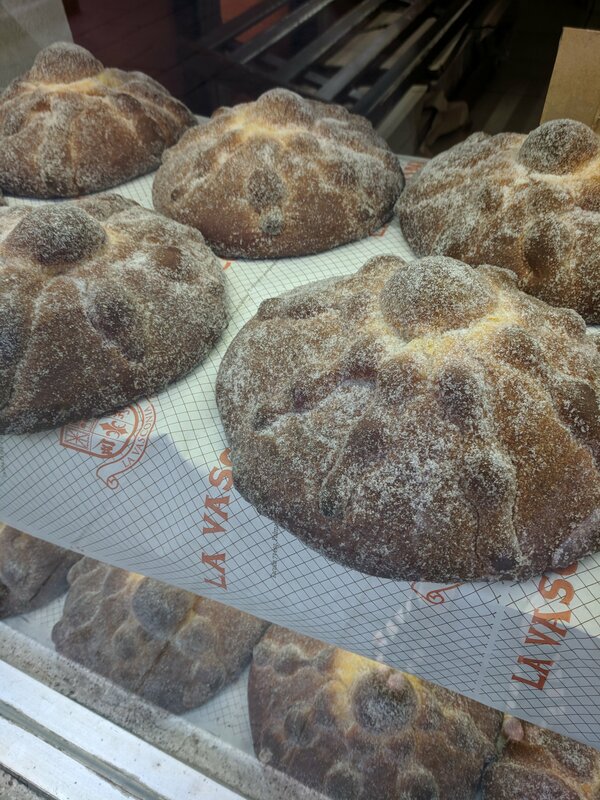 These favorite items are placed on the graves along with bread of the dead, a sweet bread baked with a skull and crossbones into the dough, flowers, and candles. During this time, families gather at the cemetery to clean and refurbish grave sites. After the work is done, many will bring food and drink and make a night of celebrating the lives of these important family members. Storytelling and reminiscences play a big part of the gatherings. Copal incense is burned to help guide the spirits of the dead back to the gathering so they may partake in the celebration of remembrance. 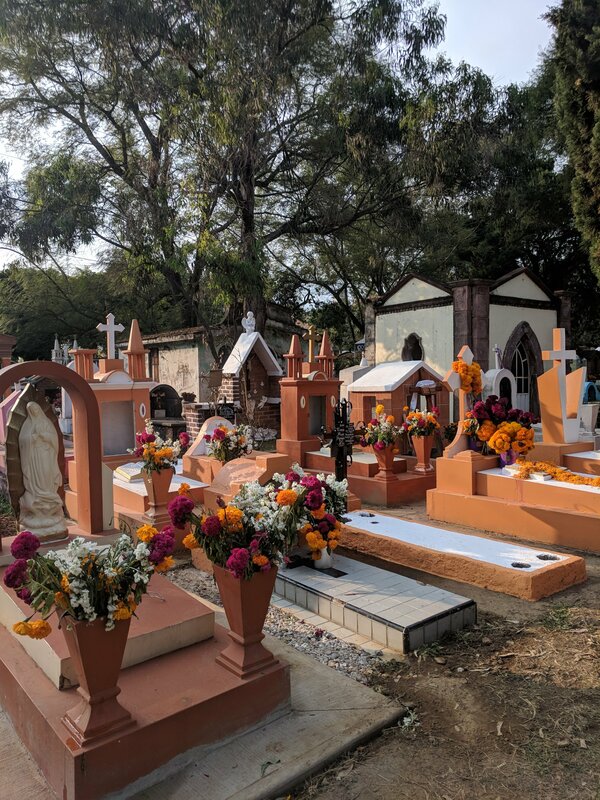 Markets are filled with Marigolds or cempasuchitl (flower of the dead), which are much taller and bigger flowers than the Marigolds seen in most gardens, which are purchased to decorate the graves. The flowers add color and scent to the altars, to guide the dead back to celebrate with friends and family. Decorated graves in a cemetery outside of Cuernavaca. 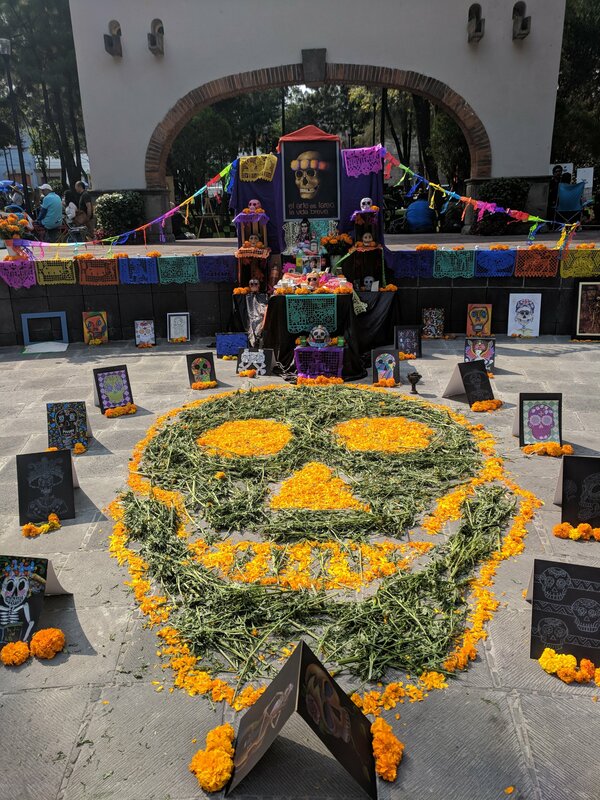 El Día de los Muertos is recognized across the entire community with altars to remember those passed, not only in homes but in stores, local plazas and community centers. 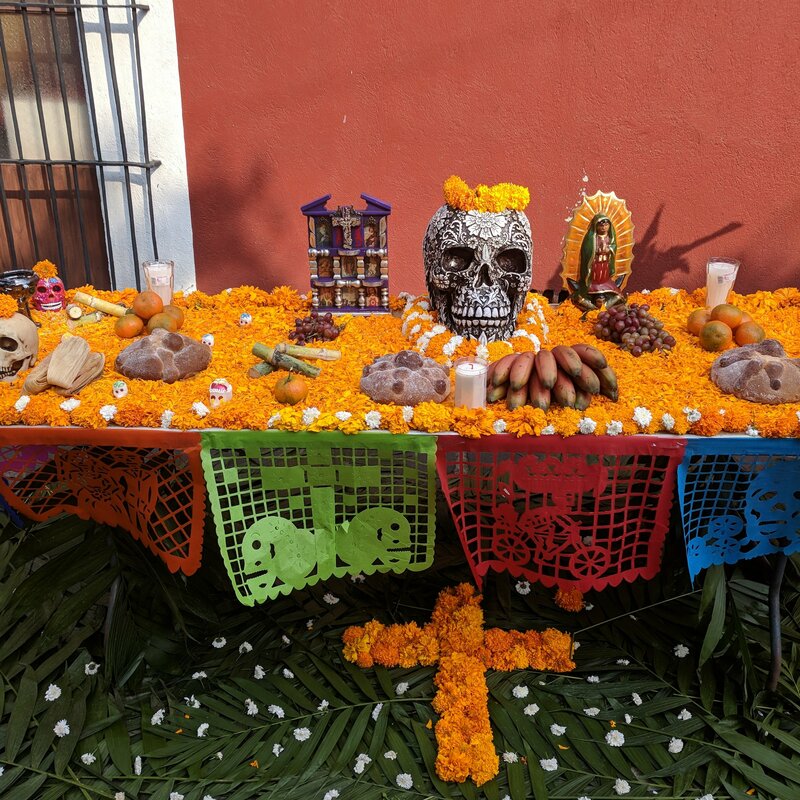 The altars are creative and personal: sugar skulls are embellished with colorful frosting spelling out the names of the remembered sit alongside photos of the remembered, festooned with papel picado, cut paper banners. Here in Mexico there is a beautiful tradition on November first to remember departed loved ones. The Day of the Dead (Dia de los Muertos) allows families and friends to recount tales of the dearly departed, bring their favorite earthly pleasures to their gravesite and gather to remember. For instance, if Uncle Ricardo loved tequila and Pall Mall cigarettes, his altar would have those items, as well as some bread of the Dead (Pan de Muerte), flowers, candles, and other little delights. Copal incense would be burned in hopes that the smell of the flowers and incense would draw him back for that one night to be with the family again. For anyone seeing these customs for the first time, the skulls and images of skeletons used in decorating might seem scary at first – but as a Mexican way to laugh at death, it seems fitting. Candy skulls made of sugar and chocolate make perfect decorations. In some stores you can get your sugar skull customized with names. Most homes have personal altars, and the deceased’s gravesite would be cleaned up and decorated as well. Entire families gather at the cemetery on this night of remembrance, bringing food to share along with the memories. Sharing remembrances and even funny stories is one way to bring the departed back for one night, until next years’ Dia de los Muertos.